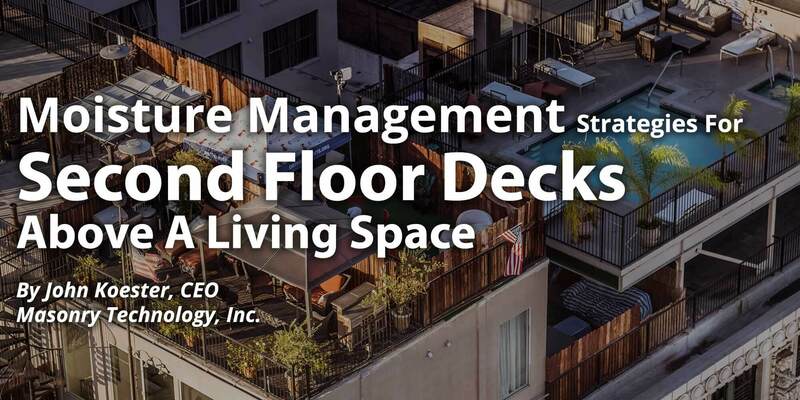 Moisture Management Strategies for a Second Floor Deck above a Living Space | Masonry Technology, Inc. Although these three points seem reasonable and straightforward, they are often ignored! One of the reasons may be that some professionals in the construction industry actually believe that there is such a thing as “waterproofing” and that nothing more is required. They believe this because there are hundreds of high quality moisture resistant products out there with thousands of sales people saying these products will waterproof something, anything and everything! How Does Good Moisture Management Apply to Verandas? Verandas (porticos) are commonly used as second story decks. If they are used as walkways to connect exterior doorways to connected rooms they are called a gallery, promenade or loggia. The characteristics that add degrees of difficulty to these moisture management systems are that they need to be durable for traffic bearing. In many cases there is an aesthetic requirement – people want them to be pretty! A common traffic bearing overlayment that would accommodate these requirements would be stone overlayments in various patterns. A support system for the stone overlayment that may include some type of pedestal paver system for each stone corner, a mortar bedding system, etc. It should be apparent by now that the design and execution of the construction phase of a moisture management system on a veranda is no task for the amateur or uninformed professional. There are several factors that add even more difficulty to this type of construction. A second area of focus is the top surface of the structural deck. Unfortunately, this is one of the most overlooked and neglected aspects of good moisture management of verandas. With inadequate slope-to-drain on the structural deck, moisture will accumulate and pond. At best it will drain slowly. Long-term, continuous moisture presence in and on this construction detail will greatly increase the risk of a leak through the waterproofing system, accelerating the deterioration of the bedding system and stone overlayment. An improper or inadequate pathway for liquid water to run off of the waterproofing system on the structural deck and out of the support detail for the stone overlayment is another point of concern. Water may want to run in a design direction with slope-to-drain, but it will need a space (void) to run through. This drainage plane will be created by the height of the support pedestals in the stone paver pedestal system and by the drainage plane system installed under the bedding mortar of the stone overlayment system and over the waterproofing system. These drainage plane materials also act as a protection mat for the waterproofing system. The perimeter detail’s requirement for liquid water to flow off the edge of the sloped-to-drain top surface of the traffic bearing stone is key and can be made more complicated by aesthetic requirements. This water may transport varying amounts of impurities (soot, dirt, organic debris, and dissolved salt and minerals from the stone overlayment system. If this water comes in contact with the vertical face of the exterior wall, it will stain the wall. Besides the negative aesthetics that may result from this contact, there is the potential for structural deterioration of the vertical wall. Inadequate perimeter drainage detailing is the most common design flaw. The design and construction of these details conflict with the aesthetic appeal of the rooflines and face of the supporting wall, and designers are too restrictive with them. In doing so, they can be too small and too few to be functional (Pretty, but pretty wet!). In the case of improper or inadequate railing installation, the structural deck designer missed an important design requirement. 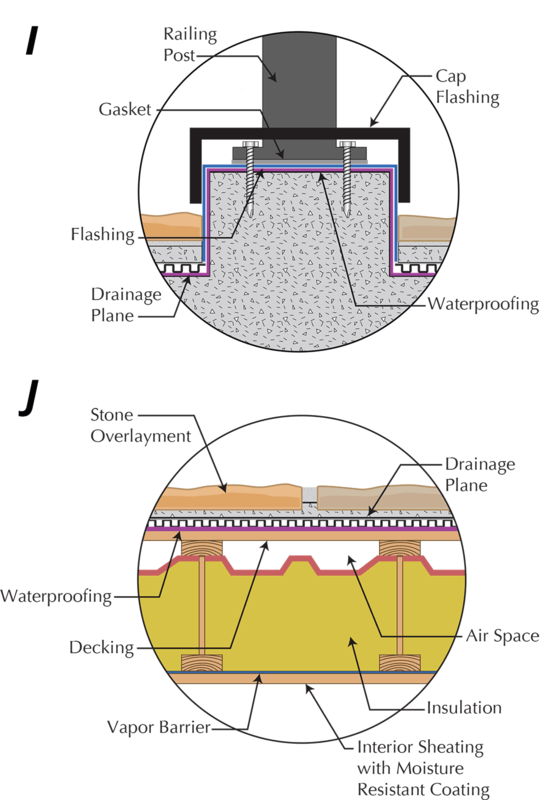 The structural deck design should have had pedestal curbs built in and up past the top surface of the stone overlayment, and they should have been included into the waterproofing system. (I) The structural deck of a veranda has to be insulated, and the insulation material has to be kept dry. A vapor resistant coating or covering on the exterior surface of the interior sheathing. Decks above living areas (verandas) need to be designed and built with great care. In many areas they are becoming more common because of local zoning requirements (restrictions on hard surface landscaping that affect surface water runoff). They can be a design requirement; they can be beneficial; they can be very functional and they can last a long time (with proper maintenance) if they are designed and built correctly!